PHOENIX – The USTFCCCA Convention is bigger than ever. 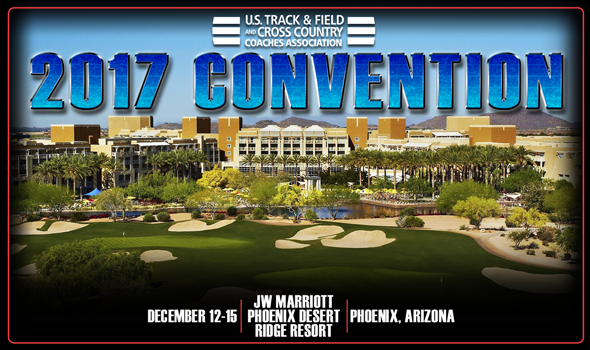 More than 1700 cross country and track & field coaches registered for the 2017 USTFCCCA Convention, which is set to begin this morning at the JW Marriott Phoenix Desert Ridge Resort & Spa. This is the first time since 2014 that the USTFCCCA Convention returned to the Grand Canyon State. Back then we had more than 1300 coaches in attendance, which means it has grown by more than 400 coaches in the past three years. That’s not by mistake either. The USTFCCCA Convention has become the annual go-to spot for important business meetings, professional development and special events you can’t get anywhere else. On Wednesday, six coaches will be inducted into the USTFCCCA Coaches Hall of Fame: Amy Deem (Miami (Fla.)), Pete Farwell (Williams), Jack Hazen (Malone), Bob Kersee (Cal State Northridge and UCLA), Fred Samara (Princeton) and Patrick Shane (BYU). Five of those coaches have spent their entire careers with the same program and all six have more than 25 years of coaching experience to go along with countless accolades. The Bowerman Presentation takes place two days later and that’s when we’ll find out the winners of collegiate track & field’s highest honor. The men’s finalists are Christian Coleman, Fred Kerley and Lindon Victor, while the women’s finalists are Maggie Ewen, Keturah Orji and Raevyn Rogers. Both of those events will be broadcast on Facebook Live, while The Bowerman Red Carpet Show and The Bowerman Presentation will also be shown on FloTrack. Throughout the week coaches can also check out 32 technical symposiums, which are presented by REKORTAN this year. Eight seminars will be held in each of the four disciplines: endurance, jumps, sprints/hurdles/relays and throws. And The Bowerman isn’t the only award being handed out in Phoenix. The 2016-17 USTFCCCA Program of the Year winners will be honored, as will the recipients of the George Dales Award and the Jimmy Carnes Distinguished Service Award, among others. Be sure to check back throughout the week for more dispatches from the 2017 USTFCCCA Convention, which runs through Friday.